As I've mentioned previously, having a December birthday is fortuitous in so many ways. One of them being that people often give you ornaments for gifts. So while I have tons and tons of ornaments that were given to me over the course of my 18-22 years before leaving my parents' home, my husband was not as fortunate. 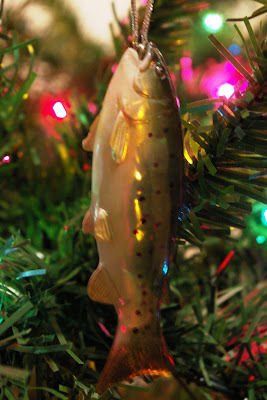 So this fish ornament is one of the first ones I purchased for him soon after we were married. Bob is a fisherman and loves all things fishing. Once I saw this blown glass fish ornament, I knew he would love it. And love it he did. Our tree is now an amalgamation of old ornaments from my youth, new ornaments I've purchased as an adult, and Bob's manly ornaments. I love it.